The Holy GreatMartyr Theodore Stratelates suffered for Christ in Herakleia on 8 February 319. At the time of his sufferings the holy Greatmartyr Theodore ordered his servant Uaros to bury his body on the estate of his parents in Eukhaitos. The transfer of the relics of the Greatmartyr Theodore was done on 8 June 319. 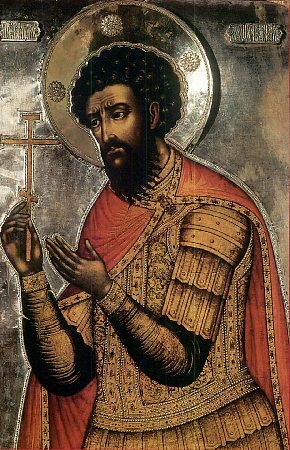 On this day also is remembered a miracle from an image of the Greatmartyr Theodore in a church of his name, at a place called Karsata, near about Damascus. The Saracens had turned this church into a residence. One of the Saracens shot an arrow into the image of the greatmartyr. From the shoulder of the saint, where the arrow had stuck into the wall, blood flowed forth in front of the eyes of everyone. A short while later, the Saracens who had settled in the church, killed each other. Accounts about this miracle are given by the holy Patriarch Anastasias of Antioch (+ 599, Comm. 20 April) and the Monk John Damascene (+ c. 780, Comm. 4 December).